Before I put this week's posting for Letter 11 onto the blog, I thought I'd put a few more poems by James Austen onto this blog. Like his son, James Edward Austen-Leigh, James had real gifts as a writer: as a grave, melancholy poet mostly. Clare Harman says (I agree) that the family respected James for his gifts far more than Austen until she actually succeeded in publishing S&S. He would be seen as serious, learned, a man. Much as they liked novels, novels were an inferior form, and anyway Jane could not get anyone to publish hers. I put these onto the listservs, Austen-l, Janeites and WomenWritersthroughtheAges @ Yahoo when we were reading Austen-Leigh's memoir of his aunt on these listserv communities which I wrote about here, together with one by his father, Jane's brother's poems (Lines written at Steventon in the Autumn of1814, after refusing to exchange that Living for Marsh Gibbon in the borders of Buckinghamshire & Oxfordshire -- which shows the father fending off his wife's anger because he refused to take livings he could not find the time genuinely to care for. I've been reminded of James because of the letters we've been reading and also an essay by J. Walton Litz's on The Loiterer where James was the prominent figure, at the time a witty young man. The Loiterer shows that while the early James Austen still preferred tragedy to comedy and wrote melancholy prologues, was a much brighter happier man when he was young than when we meet him in later life, chained (I would put it) to Mary. I see him as marrying on the serious re-bound from his disappointment in not getting Eliza. Mary openly favored her children by him and was apparently so hard on his gifted older daughter, Anna, she had periodically to be send to live with her aunts and grandmother at Chawton. 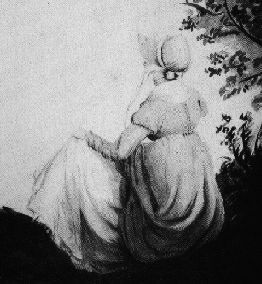 In later life in one of the letters Jane Austen says what a disappointment he has become: the family did believe in his gifts, which (like many people) he not only never developed but it seems from his life's choices as well as chances that did and did not befall him, he regressed from. James spent much energy pushing himself to accept his wife and placating her. In his poems we find him doing this too. He died not long after Austen. JEAL in his book and his daughter in hers had the courage to talk openly about the horrors of the harridan aunt Jane (the misery, theft-inclined one) with the legacy they longed for until her death (and which she continually held over their heads), but he never did justice to his father. Too painful. I see JEAL's memories of his boyhood in a fraught home as the true context for his emotionalism in his biography of his aunt. James's best poems do seem to be to beloved family members, especially his children and one to Austen on the publication of Sense and Sensibility. I've not included these as they have been reprinted before: two on a cat the famiily owned, "Tyger's Letter to Caroline, 1812," a third on this cat, "Address to Tyger (on his stealing the steak reserved for the author's luncheon) and the touching "To Edward on the death of his first pony." See The Poetry of Jane Austen and the Austen Family, ed. David Selwyn. But perhaps I'll come back for another blog another time. Those I've chosen place him against the skim of his century and other poets like him. I'm suggesting he should be valued not as a brother of Jane but as a minor poet in his own right. This one shows his kindly nature and love of his son, plus the gentleness of his tone and how he can turn a line into talk. A record of our mutual love. When some months hence, the wish't vacation. To Parents, home & friends beloved. Of which my Edward is the theme. The parent, tutor & the friend. That Heaven would keep him in it's care. The evening of his parent's days. The hearts of those who gave you birth. And pleased survey the well known scene. Or the horn's hoarse but cheerful sound. Joys pure as these you have not found. In your remembrance we shall live. Were ever kind, I trust, to thee. A few comments. I wonder if James Austen read "This lime-tree bower, my prison"? The prosody reminds me of John Dyer's "Grongar Hill" -- whom James Austen imitates in his "Selbourne Hangar"
I'm sometimes aware of how smart and how well read in the Austen sources is Andrew Davies. The line about his boy whose "cheerful looks/Were never damped by sight of books" reminds me of a line in the 2008 S&S by Davies: Davies has Fanny Dashwood say to Edward Ferrars: "you know you just say these things to irritate me." Edward Ferrars has been praising the library they are standing in and the books. Davies may be half-remembering James Austen for I feel in this line is a memory of someone who was not cheerful when one mentioned books and whose spirits were "damped", i.e., his wife, Mary. And there's emotional blackmail going on here. The boy will of course reward his parents for their tender care &c. We can see how James is pressing on his son to compensate for all the loneliness of his own existence, and how much he tries hard to create some ideal realm and knows it: "These are my day dreams"
We can see too how much the family knew Cowper. The line about Cowper's mother comes from some poem James knew well and expected his son to know. It is a joy to have such a congenial child: the father knows his son will understand what he reads and react to it in a way similar to himself. And thoughts of Home into my heart instill. Tinting the woodlands round with radiance pale. In Selwyn's collection it follows a series of sonnets, one to Lady Catherine Powlett, and then one to each of the seasons (Winter, Spring, Autumn and Summer). As I read the above, I thought of William Bowles and have to admit Bowles is more striking. Possibly because he's more openly pessimistic. There's good quiet feeling in James Austen's sonnet too. Or muse, lone Melancholy's favoured child. Ye towers sublime! deserted now and drear! But where now clamours the discordant hern! Saved by the historic page -- the poet's tender lay! Quick to the southern climes to wing thy flight. Beneath dark Autumn's sway, or Winter's tyrant reign. He uses 5 rhyme words; this and the layout of the poem reminds me strongly of the sonnets of Mary Sidney Wroth. Now I doubt he knew her sonnets, but both are rising to the challenge of the form. By contrast, Charlotte Smith is happy to do Shakespearean sonnets (which allow for many rhymes). I don't know the typical rhyme schemes of the other sonneteers of this era (the Wartons -- who I suspect James would have read -- Bowles, Seward) well enough to pronounce. Again I like the tone, the attitude of mind and feel of the piece. I know it's not original in diction :) he's writing out of Thompson's Seasons. With Sense so attemper'd is finely portray'd. And the feelings of Marianne live in that Breast. And the Sense of your Readers t' amuse and delight. I like his poetry and plan on ordering the book which contains James Austen's poetry one of these days. Yes, but the look alike might be the result of third-rate artists drawing everyone to a same 'ideal' norm so it's hard to say. Still both have what I'd call an "effeminate" kind of look. What is the authority for saying that's Harris Bigg-Wither. It comes from a site which isn't scholarly at all. That's okay if the person tells you where he or she got the picture from.